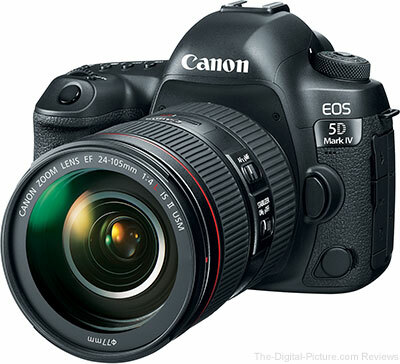 The Canon EOS 5D Mark IV page has been significantly updated with lots of additional information since last mentioned here. This camera should be on the streets very soon. B&H is still indicating that the 5D IV body and w/EF 24-70mm f/4L IS Lens kit "Will begin shipping Thu, Sep 8" with the added disclaimer "(Subject to availability)". Adorama is saying "Manufacturer will start shipping this item on 09/08/2016." Amazon is stating "This item will be released on September 8, 2016." September 8th is only two days away – Woo hoo! The 5D IV kit with the new Canon EF 24-105mm f/4L IS II USM Lens is not scheduled arrive at retailers until October 31st. However, with no savings realized by the kit purchase, my recommendation is to preorder the camera and lens individually. You'll then get both as quickly as possible. The Canon BG-E20 Battery Grip for the EOS 5D Mark IV is also scheduled to arrive on September 8th. While not inexpensive, the price of this accessory has settled down to the $349.00 price that B&H initially listed. There was apparently some confusion early on as Adorama and Amazon initially priced the BG-E20 at $490.00. Also scheduled to arrive on September 8th is the Canon WE-1 Wi-Fi Adapter. Because new firmware is necessary for this adapter to work, expect new Canon EOS 5Ds, 5Ds R and 7D Mark II firmware to also become available very soon. We'll share that news as soon as we have it. Important: Using this site's links to place your preorders provides the support we need to keep this site maintained. Thanks for that! Should I get the Canon EF 85mm f/1.8 USM or the Tamron 85mm f/1.8 Di VC USD Lens?